Stretching over four miles through the center of the West Bronx, the Grand Boulevard and Concourse, known simply as the Grand Concourse, has gracefully served as silent witness to the changing face of the Bronx and New York City. For a century, it has truly been a boulevard of dreams for various upwardly mobile immigrant and ethnic groups. Constance Rosenblum unearths the colorful history of this grand street and its interlinked neighborhoods. With a seasoned journalists eye for detail, she paints an evocative portrait of the Concourse through compelling life stories and historical vignettes. 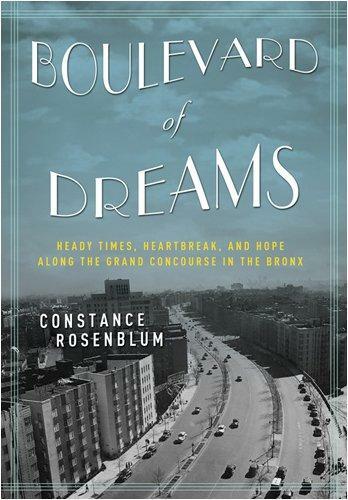 The story of the creation and transformation of the Grand Concourse is the story of New Yorkand Americawrit large, and Rosenblum examines the Grand Concourse from its earliest days to the blighted 1960s and 1970s, right up to the current period of renewal. Constance Rosenblum was the longtime editor of the City section of The New York Times, a Sunday section that used the techniques of narrative nonfiction to explore issues affecting New York City and the texture of life in the five boroughs. From 1990 to 1997, she was editor of the papers Arts and Leisure section, and previous to that she was deputy Arts and Leisure editor. Prior to joining The Times, she was culture editor of The Philadelphia Inquirer and a reporter and editor at The New York Daily News. In addition to Boulevard of Dreams, she is the author of Gold Digger: The Outrageous Life and Times of Peggy Hopkins Joyce, a biography of a Jazz Age celebrity, published by Metropolitan Books/Henry Holt. She is also the editor of two collections of essays: New York Stories: The Best of the City Section of The New York Times and "More New York Stories," both published by NYU Press. Rosenblum currently writes the Habitats column in the Sunday Real Estate section of The Times, and a collection of her columns will be published next year by NYU Press.